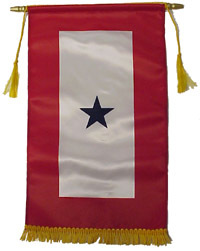 HomeAwareness By ColorYellow Awareness ProductsSupport our TroopsBlue Star Service Banner 8" by 14"
This beautiful service flag is made of a bridal grade satin material and the bottom is trimmed in a vibrant gold fringe with matching gold tassels. Made in the U.S.A., our 8" x 14" inch banner is the perfect addition to any military family's home. Let everyone know you support the troops, with one in particular. The bridal grade satin offers a soft sheen to the banner for a rich appearance. The soft silk like 1" gold fringe makes a dramatic finish to the bottom of the banner. The gold cord with 2" tassels make a beautiful presentation. The gold spear tips make a nice finished look. The flags were good quality and I received them in 3 days with first class mail. Loved the blue star family banner. High quality product. Will be ordering from this company again. I love my new Blue Star Service Banner. As a parent of a Marine, this is a reminder of my son's dedication to our country. I have it hanging proudly in my office. Quality, size, price, etc. are great. I recommend this product to all other Blue Star parents!